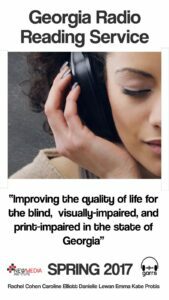 The Georgia Radio Reading Service is a 24-hour audio programming that serves the blind, visually-impaired, and print-impaired population in Georgia. Our team is designing a modern and interactive website dedicated to providing audio content in a digital, more accessible manner. Currently, the GaRRs website is extremely outdated, as shown above. The archive of resources is not up to date, and the functionality is not modern. Not all users receive reception with the current technology, and the span of accessibility is limited to only the state of Georgia. Our solution is to create a dynamic website, fully accessible to any individual qualified to be visually-impaired, with accessibility nation-wide. Our idea of a website is not original. GARRS already has one in place. However, the new website will be revolutionary. In excitement to grow the service and reach, a website can be accessed globally. Our added features, such as a user management system, will allow GARRS to track their users right from the comfort of their office. The audio livestream will be more functional, and the customization for each user will be enhanced. The features we have chosen to incorporate will improve the experience of users and overall make what might seem like a difficult lifestyle daily — easier. This is where we will apply our knowledge of “new media”. First, we will use the affordable hosting company, GoDaddy. Then, we will incorporate a user management system for new users. WordPress will be our base platform to build the new website from the ground up. Within WordPress, we will utilize our skills of HTML, CSS, and incorporate widgets for a dynamic and responsive interface. Additional features will include a contact page, Google Analytics to follow the site traffic, and Seriously Simple Podcasting as an affordable content organizational system for the archived audio material. Right now, the reach for GARRS is limited locally because of the breadth of the radio signal. Individuals not in reach of the signal do not have access from their homes. Initially, the service was designed for citizens of Georgia. The new web accessibility will not only expand the reach nationally, but also allow access from any mobile device. The impact could even possibly be global one day. More than we thought imaginable with a school project. Not only are the base technologies difficult for our level, but the concept of visually-impaired technologies is a new territory for the entire group. Like many Capstone groups, we are creating a fully interactive website, with multiple features and accessibility tools. However, our mentality is targeted towards users who won’t be able to see our final product. Another great lesson learned so far is that of time management. We spent two months in the planning phase of this project, and now it is game time. With less than five weeks until SLAM, it is crucial we continue our same plan-oriented working methods to have a successful end result. Our group is unique in the fact our main benefit of our product is geared towards improving the lives of those who struggle a little extra each day. We can’t begin to imagine how we would navigate through life with impaired eyesight, and it is our goal to make that process as easy as possible for our users. We want to make their alleged weakness a strength. We are very confident our added features and modern website will be a sigh of relief for visually-impaired users while accessing their news and entertainment each day. The Georgia Radio Reading Service is an independent non-profit for the citizens of Georgia, and they do not currently have any partners. However, we hope with the expansion of the service nationally, other visually-impaired services will jump on board with our mission through this technology. With the interconnection of the internet, we are hopeful the website will be a promising platform for other states and eventually merge into one unit. That way, the resources and assistance will be even more available to those in need.